If you have HDFC card, you actually get ten percent cashback. So, definitely make use of that offer. So it's an additional discount that you can get if you use that card. For example, the Real Me 2 Pro, Real Me 2, Real Me C1, Moto One Power, Poco F1 will have that offers of 10% with HDFC cards complete mobile protection and the buyback guarantee. That generally you will not find in the regular sale. And guys this 10% HDFC discount will be applicable to all the mobiles that we are talking about. So, apart from the regular discount that you are getting for example, let's take the case of Honor 9N, if you want to buy, let's say it was for 12,000.
further discount. So again, make sure you apply that. And now moving to some of the picks that I have these are my personal pics among all these smartphones, not in a particular order. These are my 5 top picks I would say. I really like that phone. Very powerful Snapdragon 660 at Rs14,000 is a no-brainer. 2. 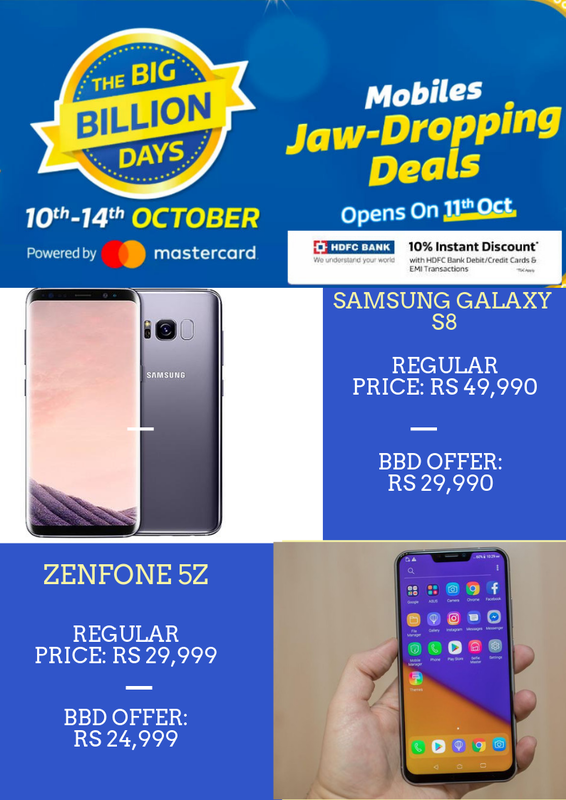 Then in flagships I'm liking the Asus Zenfone 5Z, they're getting that Rs 5000 to be flat discount add that HDFC Discount, it's incredible deal. 3.Then we have the Poco F1 also, that's also very good phone, if you can, if you actually like. 4. Then we have the Real Me C1. I like this in the budget range, at Rs 7,000 rupees to Snapdragon 450 SOC, it's simply a no-brainer in my frank opinion. 5. And lastly we also have the Redmi Note 5 Pro. Regarding the Redmi Note 5 Pro, there will be some offer but as of now they don't have the exact offer details. So, but I can stay tuned, this will also be on the offer. That is the Redmi Note 5 Pro. So, again guys stay tuned for that. So, these were the offers that are available on this FlipKart Big Billion Day. Again take advantage of that guys and again don't forget that 10% cash back offer you'll be getting if you use the HDFC card.